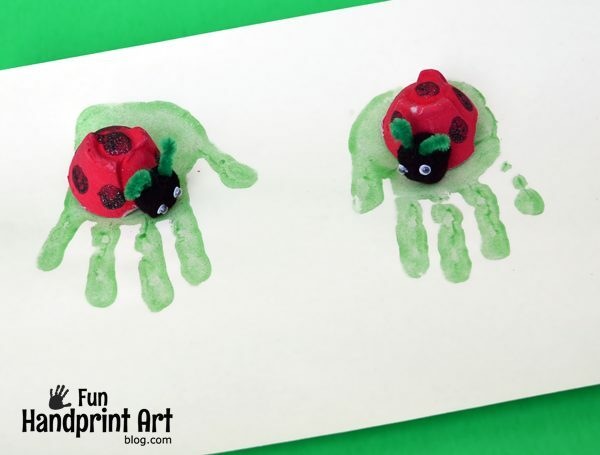 Here is a fun Spring craft that kids as young as 3 will enjoy making – a recycled egg carton ladybug! Aren’t they adorable? Little Sister and I made them as a mommy and me craft while Big Brother was at school. We couldn’t resist adding handprints and fingerprints! Guess what else? There are even more egg carton crafts from our blogging buddies at the end of this post! This month’s collaborative craft challenge is egg carton crafts. I can’t wait to see them all! I think you will love them too. Cut the egg carton into sections. We made 2 ladybugs somwe just cut 2 of the egg holders from the carton. Paint it red. Let dry. In the meantime, make handprints by adding a drop of green paint to the palm of the child’s hand and ask them to rub their hands together until both are completely covered in paint. 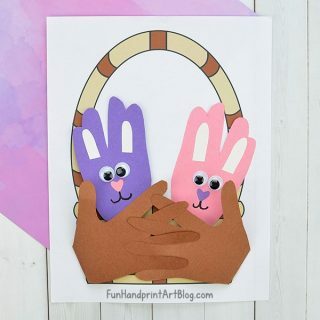 Press down onto a sheet of construction paper or cardstock. Once the red paint is dry, make fingerprint spot using black paint. We actually used black glitter glue for ours. Little Sister squirted dots all over the ladybug’s body and then smushed them gently with her finger. Grab a black pom pom and glue it to one side of the red egg carton. Add teeny googly eyes. We used the kind that comes with a sticky back – so much easier to get them to stay put! Cut 2 small antanea from a pipe cleaner and poke them through the top of the head. 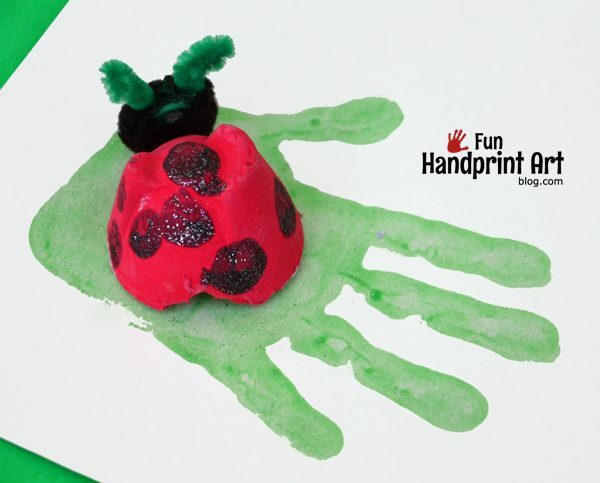 Set the ladybug on the green handprint leaf. 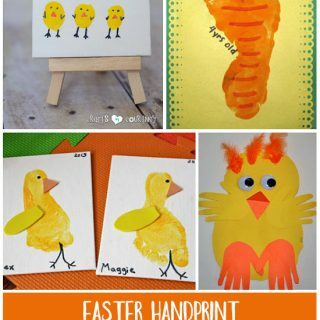 You may wish to glue them to the handprint or even cut the handprints out. Little Sister gets a kick out of playing with her crafty creations that are perfect for pretend play so we left them unglued. I can already tell how much she loves playing with them! 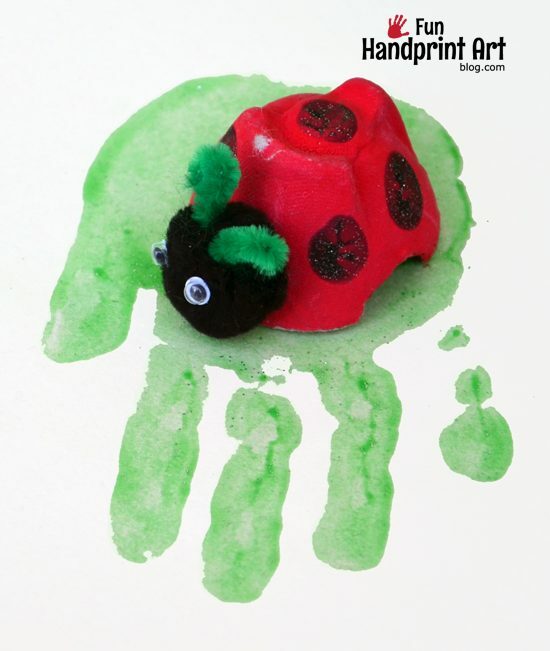 A recycled egg carton ladybug – what a great idea! Not only funny to do, but also useful when fighting waste in our household! Greetings!